Submitted by Sister Pauline Quinn, O.P. 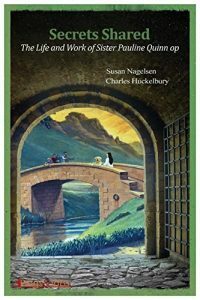 Secrets Shared: The Life and Work of Sister Pauline Quinn op is written by Susan Nagelsen and Charles Huckelbury. It is a story of my life traveling on a journey because it was something that God was speaking to my heart to do. No matter what happened, I wouldn’t give up. Even though I fell many times from the pressure of rejections and indifference, I kept standing up brushing the dirt off then went out and helped thousands. Pope Francis wants for us to look at people who have been traumatized and abused, giving them the spirit of welcome by showing them respect and dignity which will help build their self-esteem and they too can move forward to contribute something wonderful to better our world. God works in mysterious ways to show us his compassion and mercy for others, hoping that we learn that all life is important and we have the strength to help rebuild damaged lives by our love. I had no high school education, wounded, little support yet I went out and helped thousands because I found within the Dominican family where I belong. Sr. Pauline Quinn, O.P.’s new book was released on October 14th and “captures a remarkable life in transformation.” The book shares Sr. Pauline’s profound story about overcoming struggles in life to find meaning and purpose and keeps with the Holy Father Francis’ want for the Church—“Pope Francis has called for a Church that is more welcoming to people with disabilities.” This book also shares the story about starting the prison dog program that is all over the world now. 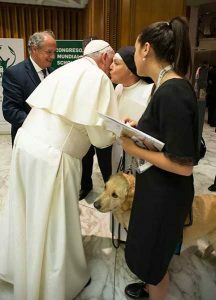 Sr. Pauline’s dog Pax in Argentina. 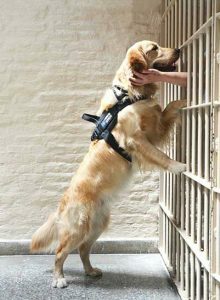 Prisoners can’t touch one another in the United States, and the staff are not allowed to touch prisoners, but the dogs can love them, giving them licks and wags. The dogs live in the prison with the inmates.